Planetary nebulae, though their name seems ambiguous, are really clouds of gas. They are called “planetary” because when they were first discovered astronomers saw these nebulae as round and colorful; they looked like the planets in our solar system. A planetary nebula is produced by an intermediate-mass, Sun-like star going through the final stages of its life cycle. As such a star evolves past the red giant stage, the outer gaseous layers detach from the stellar core in a series of violent “puffs,” shedding the atmosphere. 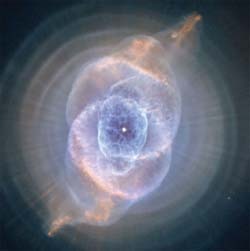 Some well-known planetary nebulae include the Ring, the Cat’s Eye, the Hourglass, and the Helix.